Polish and protect in one step! 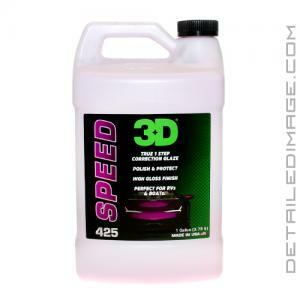 3D Speed allows you to remove imperfections and protect your paint in one easy to use formula! 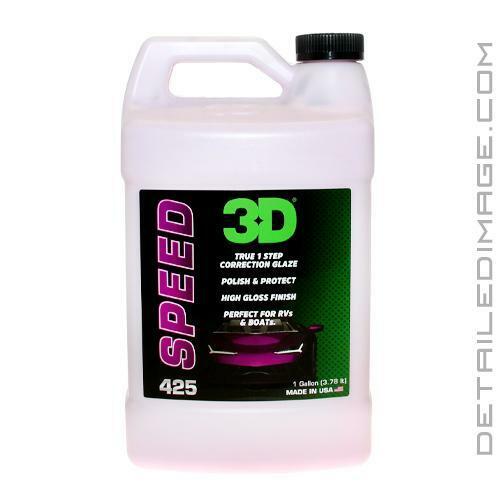 This unique product from 3D was originally called HD Speed but is known as Speed now. While the name changed the incredible results that have made this product so popular have not. 3D Speed is well known in the detailing community for helping professionals and enthusiasts get impressive results very quickly. Just add a few dime-sized drops of product to your polishing pad and work it in or apply by hand with medium arm pressure. The high-quality formula will help you remove light to moderate imperfections (scratches and swirl marks) while increasing clarity and leaving a layer of wax-like protection behind. The application is so easy and it removes almost just as easy, without any dusting. Imperfections are no match for this polish and the wax looks amazing while preserving your paint. The product is also a great value because you get such outstanding results and one bottle lasts so long. The name Speed says it all because it speeds up your detailing process while tackling multiple detailing steps at once. We highly recommend you pick up a bottle today and experience these results for yourself. All-In-One Polish. HD Speed polishes and protects the painted surface in one easy and simple step. Removes light to moderate surface scratches and swirl marks. This product restores color, depth, and gloss while adding some wax to the surface. Its exceptional open time allows longer polishing and waxing period, and less product use. Product works best when applied in a shaded area. Great for those who want quick, minor paint correction and protection. Shake well before use. Apply in a shaded area. Use a cutting foam pad and apply 4-5 pea size drops onto the pad and work on a 2' by 2' area. Best if used with a DA Random Orbital Polisher. Set the polisher at 5000 - 6000 OPM. Using moderate pressure and overlapping passes, work product moving polisher very slow to correct defects. Repeat process if needed. Use a clean dry microfiber towel and buff product off by hand to get a high gloss finish. This is a great product, went on with ease and what a soft mirror finish it leaves. I used it for the first time on a 2018 Tahoe that I recently detailed. I was very impressed with HD Speed. it will now a fixture in my detailing arsenal!